Open your heart, and become the change. What truly brings us happiness? What are the essential problems facing our world today, and how can we solve them? What is at the heart and soul of the cultural “Hungry Ghosts” that seek happiness and fulfillment through money and things, instead of from within? In this inspiring and thought-provoking film, Compassion in Action, the Dalai Lama and some of the most innovative and revolutionary thinkers of our time explore the sources of unhappiness and happiness in our world. This film is a deeper exploration of the ideas presented in the internationally successful documentary film Dalai Lama Awakening (narrated by actor Harrison Ford), directed by award-winning Producer-Director Khashyar Darvich. Also features other revolutionary thinkers like Fred Alan Wolf, Jean Houston, Elisabet Sahtouris, Thom Hartmann, David Korten and others. Limited seat available, please purchase tickets ASAP before they sell out. Don't forget to invite your friends and families. Bringing Tibet Home_When a Tibetan refugee dies from a terminal illness, his last wish to set foot on his native soil remains unfulfilled... until his son, Tenzing Rigdol, a New York-based artist, embarks on an unthinkable journey to reunite Tibetans in exile with their land literally through an art project. A young artist sets out on a mission to bring Tibet home to its people through an art project that involves smuggling 20,000 kilos of native Tibetan soil across the Himalayas from Tibet into India, while spanning the borders of three countries. By virtue of his small mission, he forever touches the hearts of many Tibetans living in exile who are unable to return home. 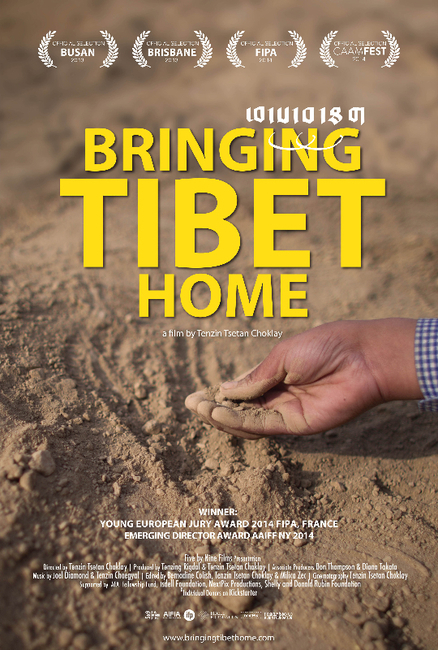 Bringing Tibet Home is a documentary film currently in production. It tells the story of artist Tenzing Rigdol, as he sets out on a mission to bring Tibet closer to Tibetan exiles through an unprecedented art project titled, Our Land, Our People. The installation involves the artist, bringing 20,000 kilos of native Tibetan soil from Tibet to India. This soil is laid out on a platform set up in Dharamsala, India where he will give a chance to thousands of exiled Tibetans to walk on their home soil. For many this is a reunion, for some, the first time that they set foot on their homeland and for a few, this is probably the last time that they ever see anything of their lost nation. Through this groundbreaking site-specific installation, artist Tenzing Rigdol enables the displaced to ‘return’ home. Although Rigdol’s work examines the plight of the Tibetan people in exile, it also has wider resonance, exploring the notion of nostalgia, the idea of homeland and how art is intertwined with the political and the social. It also demonstrates the transgressive power of art as an act of defiance.